Writer Pearl Buck came by her in-depth knowledge of China from first-hand experience. Born in the United States, she was brought to China as an infant by her Protestant missionary parents. The author of more than 40 novels and numerous short stories and works of non-fiction, Buck is best-remembered for her Pulitzer Prize-winning novel The Good Earth (1931), a moving portrayal of the struggles of a Chinese family. She received the Nobel Prize for Literature in 1938. Less known is the fact that Buck wrote fiction about Jews in China, too. Because I’m always interested in narratives about Jewish life in other times and places, I approached her 1948 novel Peony with particular interest. 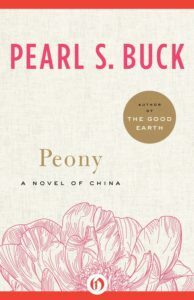 At the time of publication, Peony was hailed as an insightful study of the decline of a small Jewish community in Kaifeng, China, in the mid-1800s. But although Buck’s historical facts may be accurate—and the dangers of communal disappearance through assimilation resonate in our own time—I was struck by her reliance on ethnic stereotypes. What I found was an ambiguous underlying attitude toward Jews and Judaism. What is disturbing about it is the vague sense of pleasure in the disappearance of Jewish life that forms an unstated subtext to her narrative.